Tbilisi International Airport (ICAO: UGTB, IATA: TBS) is the leading international airport in the country, airport is located 17 km SE of the capital of Georgia - Tbilisi. It is also known as ‘Novo Alexeyevka International Airport’. Tbilisi airport it the biggest airport in Georgia. 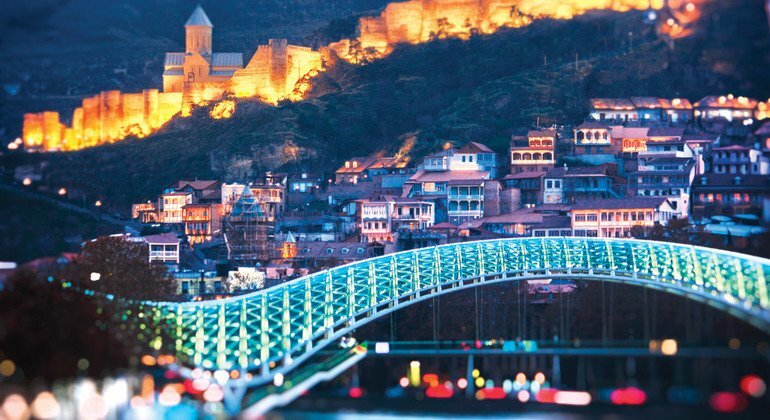 Tbilisi at night with the view of Narikala fortress and Bridge of Peace. The old part of Tbilisi with and the view on sulfur baths. TIA has 2 operating airline terminals: departure and arrival terminals; arrival terminal (total area of 12.000 m2) was only opened on September 26, 2017 due to an increase in passenger demand. Terminals are located in close accessibility to each other, therefore, there is no need for transport to get from one terminal to another. The overall area of Departure and Arrival terminals are 25 000 m² and 12 000 m² correspondingly. Throughout those terminals there are 5 boarding bridges with 41 check-in counters and 35 passport control tables in total. The Tbilisi Airport has 4 baggage conveyors with the 2400 units going through the baggage claim system per hour. Regarding the parking lot capacities: it is 934 vehicles as per car park capacity and 8 vehicles per bus park, the apron parking position has the capacity of approximately 49 cars. International Terminal “prime class” offers high class Accommodation services for all Prime Pack guests, Priority Pass Card holders and contracted organizations. Cable and wireless internet, TV, daily newspapers, weekly and monthly magazines as well as a snack bar at the lounge area, separated from loudness and flight announcements are available for the guests. The service may be possessed by anyone traveling by business class or through pre-booking. As the part of the Prime Park within the Departure terminal, member of the CIP services will be greeted at the entrance of the terminal by CIP agents and personal porter, who take all duties and routine connected with the luggage under their responsibility. Afterwards, the passengers will be accompanied to the passport control, where they can wait in the special lounge beyond the passport control while enjoying the following services absolutely free of charge: drinks, appetizers, snacks, Interne, TV, fresh newspapers etc. While being at the Arrivals terminal, passengers will be greeted by CIP staff with the porter and greeted at the special lounge at the terminal by VIP vehicles. If the passenger needs Visa Service s/he can receive it without standing in the queue. CIP staff will do everything to provide passengers with comfort, starting from the very beginning till the boarding process. Prime pack CIP both at the arrival and departure terminals costs approximately 110 €. However, if you would like to possess only CIP lounge service, the price for that it 50 €. Children younger than 6 years old are free of charge. 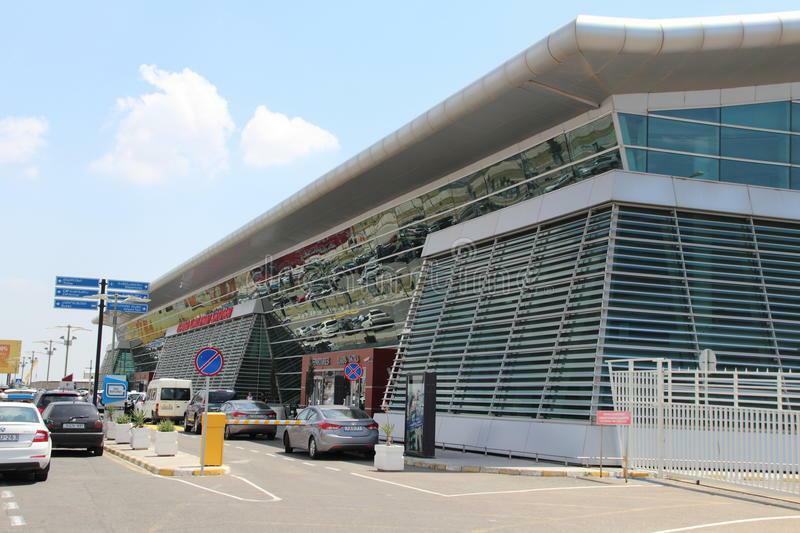 Tbilisi International Airport provides its passengers and guests with various means of transport. Outside of the terminals, just at the curbside of the Arrival Hall, passengers may find Taxi service. The service is available 24 hours a day, the fees for the taxi, however, vary depending on the distance covered(from 30 up to 50 GEL). Professional taxi drivers will get passengers at any site of the city, the journey time takes 20-30 minutes dependent on traffic and distance. Another way to get from Tbilisi Center to the Airport and vice versa is bus #37, which departs from the public bus stop located in front of the Arrival hall. It operates 24 hours a days, 7 days a week. One way fee is 0.50 GEL. Even though, that is relatively cheap way of transportation, the average route time will take from 40 to 60 minutes. The Airport railway is the easiest mean of transportation as it not only costs 0.50 GEL one way, but will also take 20 minutes to get from the center of the city to the airport and vice versa. Railway station is located 70 meters from the airport building and provides its passengers with the comfortable and renovated trains, capacity of which is approximately 100 passengers. Regarding the food & drink in the airport, there are several pubs and cafes represented in Tbilisi Airport that are working 24 hours a day. Brewmark Pub Tbilisi, for instance, with its wooden interior passengers may enjoy tasty food and high quality beer, while waiting for their flight. Cappadocia, which takes its place at the Arrivals level provides its guests with the wide variety of snacks, drinks, appetizers; passengers and guests may enjoy their drinks in a pleasant atmosphere 24 hours a day. Beer Port located on the mezzanine floor exemplifies the true British pub design, this place may become a perfect spot for travelers to relax and get refreshed as they choose from a wide selection of beverages. TON-TON which works from 00:00 until 17:30 and offers wide range of beverages and snacks. NEED-STOP kiosk will pleasantly surprise passengers with the greatest range of cakes, sandwiches and beverages during flights. Tbilisi International Airport “Prime class” Lounge located right after the passport control on the Departures Floor is operated by TAC CIP Services and works 24 hours a day; is furnished similar to an art museum. It provides its visitors with the buffet which may offer wide range of beverages; passengers may use the TV, internet access, daily newspapers, weekly and monthly magazine corner, smoking section and flight information monitors. On the Arrivals Floor passengers may await until their luggage will be brought by a porter. Moreover, greeters may use the car park at the territory of the airport and get refreshing drinks or snacks while waiting for the passengers to come. Among additional services of Tbilisi Airport there is Duty-Free area, which is presented be several types: Main Duty Free, Vintage one and Accessories area. Among products available there you may find: Perfume, Cosmetics, Liquor, Chocolates & Sweets, Tobacco products, Toys & Accessories, Local Georgian wines and souvenirs. This is not the official airport website. Contact us - Copyright © Airport-Tbilisi.com - 2018.